Last week the Trump administration released the Fourth National Climate Assessment and the Second State of the Carbon Cycle Report on “Black Friday.” Backed by 13 federal agencies and written by hundreds of scientists from government, academia, and industry, the reports synthesize and communicate the very real threats we face from climate change. 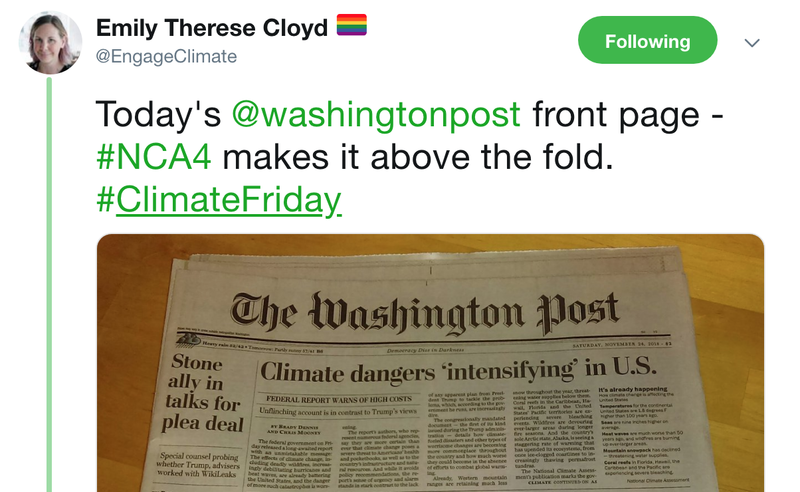 Concerned that the reports might not receive the public attention they deserved, several of us began using the #ClimateFriday hashtag on Twitter to highlight findings of the reports. By any standards, the release of the reports received quite a bit of attention. Report authors spoke with journalists over the holiday weekend and the scientific community posted highlights and key insights using #ClimateFriday. For one day — #ClimateFriday — the media and online reports about climate change focused on the science of climate impacts and communities’ responses. Posts and articles discussed the costs and risks of climate change and the urgent need for action. Decades of evidence and scientific discoveries about climate change were on display. Scientists engaged in online dialogue to address misconceptions about climate trends. Stories of adaptation to sea level rise, flooding, fire, and heat waves took center stage. In essence, we are asking that you spend a little bit of time each Friday featuring climate change in your online (and in person!) discussions, so that it doesn’t just take center stage once a year, but is part of our regular conversation. Tell your climate stories, and use the #ClimateFriday hashtag! This blog post is mirrored here, here and here.